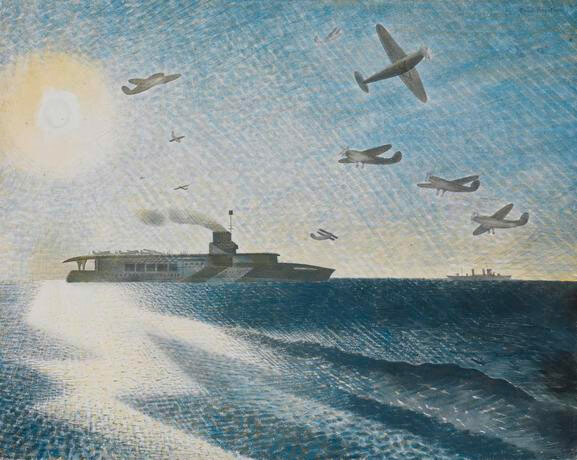 One of Britain’s finest war artists, Eric Ravilious recorded the last days of the aircraft carrier HMS Glorious, which was sunk off Norway in June 1940 in controversial circumstances and with huge loss of life, writes Anthony Kelly. Of all the official war artists employed by Britain during the Second World War few can be said to have derived more inspiration and benefit from the experience in purely aesthetic terms than Eric Ravilious (1903-42). Sadly, his participation in the war cost him his life. In September 1942 he accompanied a search and rescue mission in a Hudson aircraft of RAF Coastal Command that left its base in Iceland to look for comrades whose aircraft had disappeared the previous day. He too was presumed killed when the plane went missing and no trace of it was found. But in the three years before his death, Ravilious recorded many remarkable scenes and events, mostly involving warships, aircraft and coastlines, as though in a strange prefiguration of his own death.